Q: What do elephants have in common with the musicians and singers of our favourite band? A: They are big (in their physical and artistic appearance) and they tend to be grey. It is probably not because of these similarities that Anthony Phillips and Steve Hackett have contributed music to the Harmony For Elephants project. They are, after all, the least grey (former) members of Genesis.. There are a number of organizations to protect elephants. They create and maintain areas of retreat. Others train gamekeepers in order to deter poachers or at least be able to bring them to justice. But a changing climate and growing (human) population cause the habitats of men and elephants to overlap. Conflicts break out: An elephant that breaks into the field of a small farmer threatens the farmer’s livelihood. Elephants For Africa conducts research to understand the behavioral patterns of elephants, particularly of male elephants because they are more frequently involved in human-elephant conflicts than elephants from a herd. The findings are used to empower local villagers to live alongside wildlife, understand elephants and encourage them to appreciate the benefits that elephants can bring, while mitigating the damage that they sometimes cause. Elephants For Africa also try to instil in Botswanan youths the idea that elephants are necessary for the eco-system and therefore worth protecting. Local people are also provided with techniques that enables them to work towards decreasing conflict and increasing crop production. The overarching goal is, of course, the protection of elephants. Biologist Dr. Kate Evans has been doing field research in Africa for almost twenty years now. She has been working on an elephant research project in Botswana since 2002. Her experience has prompted her to found and chair Elephants For Africa. In order to raise awareness and funding for the cause, Dr Evans and professional photographer (and biologist) Lesley Wood have developed a joint project. They have been developing and refining their idea for a book on elephants for more than six years. 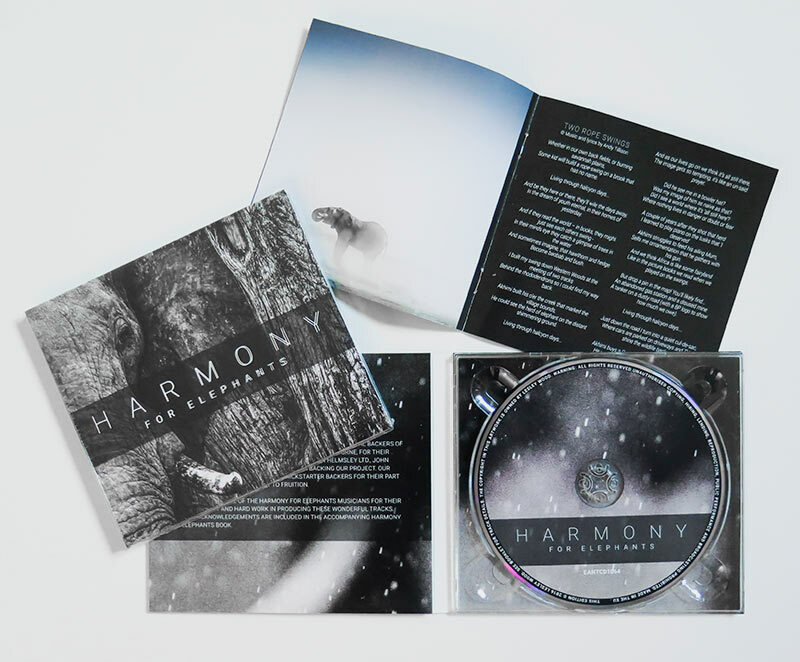 The result of this is Harmony For Elephants, a book and CD set. Funded through crowdfunding platform Kickstarter, half the profits from the project go straight to Elephants For Africa. Backers get a copy of the book in A4 landscape format (very generous backers even get a copy in A3 landscape format). They also get the Harmony For Elephants CD, for which a number of well-known musicians have donated news songs. After several heart-felt introductory essays, the focus of the book shifts to the large and very impressive photographs of elephants. Most of the photos are in colour, some are in black and white, which adds another dimension to the effect. Interspersed with the photos are brief statements. They illustrate in few words what elephants mean for Botswana and Africa. They highlight just how threatened elephants are (“The world is currently losing between one hundred and two hundred African elephants a day due to the illegal ivory”, Dr.Evans). They also emphasize in a loving way how beautiful elephants are (“If elephants didn’t exist, you couldn’t invent one. They belong to a small group of living things so unlikely they challenge credulity and common sense”, Lyall Watson). These statements are not just by “Western and European” biologists but also by those who try to live side by side with wild elephants in Botswana. The message is clear and heartfelt, and it is given straight but happily without any condescension. The list of musician reads like the guest list of a party where everybody kind of knows everybody else: Nad Sylvan has sung for Steve Hackett who took over from Anthony Phillips in Genesis. Tony Patterson, vocalist for the coverband ReGenesis, has also sung on Nick Magnus' album N'monix. Rob Townsend is part of Steve's live band. So is Amanda Lehmann. Anthony Phillips has contributed to Anna Madsen's second album Whispers. Dale Newman has worked with and for Anthony Phillips (and Genesis). Nick d'Virgilio, who used to drum for Genesis, now hits the skins for Andy Neve – they are all good pals. The album contains seven songs and eight instrumentals. Each piece has been written specifically for this release. Catchy rock music kicks off the album. Eventide (The Call Of The Wild) describes a moment of hunting and of protection – it also states the motto for the project: “We’d like to see the end of ending lives for the call of the wild”. Tony Patterson’s See The Dream sounds a lot like Peter Gabriel. The song begins like a piece from Passion before it shifts to sounds from San Jacinto. A fine song, though a bit epigonal. Sunset Trail is typical Ant Phillips on the twelve-string guitar. It illustrates how good Ant is at sketching a situation musically and then find a poetic title that really works for the piece. Perhaps my favourite track on the album. Elephants seem to trumpet in the beginning of Rob Townsend’s Play For Time, Time For Play. A peculiar piece. Trumpets imitate elephants before the track turns into big band blues … and after a minute along comes a merry xylophone tune. This music could be used very well in a video that illustrates the aims of Elephants For Africa; it suggests merrily playing elephant babies as well as the first steps toward coexistence of men and elephants – and the threat posed by the poachers..
Amanda Lehman presents the self-conception of an elephant herd in slightly esoteric sounds that cannot deny Steve Hackett’s influence (or is it her influence in his music?). Piano and guitar join forces to long, sustained chord sequences. Big, orchestral music begins, like the score for one of those monumental films from back when – somewhere between Gone With The Wind, Ben Hur and Hatari. Aerial views appear before my eyes: An elephant herd calmly marches through the shrubs – later on they will tread majestically across the screen against a setting sun. Nick Magnus has written this glorious piece, and the only flaw with Crossing The Savannah is that he is erroneously called “Mick Magnus” in the credits. One of the longest tracks on the album is the balled Two Rope Swings. Andy Tillison Diskdrive uses the toy that “Western” and African children enjoy alike to show that there are parallels between the industrialized and the so-called Third World. They are entwined, and each has cliché ideas about the other – what happens in one place affects the other both in many ways. The first half of the song is dominated by piano and reticent drums; it resembles Roger Waters’ more depressing songs (e.g. from Amused To Death) before the keyboards erupt and turn it into brisk neo-prog. Simple piano sounds introduce The Elephant’s Tale by Anthony Phillips. The merry music is marred by disturbing sounds, much like the elephants’ lives are disturbed. Variations and interruptions make this a mini-suite. This Is Our Home could well be played on AOR radio, though rather in the evening and night programmes than in the morning. Ethereal vocals sounds hark back to “choir songs” a la Adiemus from the 90s. Lorato is the second shorted piece on the album. Steve Hackett plays acoustic guitar. Dale Newman’s Mid-West accent stands out on this album. Everyone Should Know is as straightforward as the title suggests: It is a pity that something so beautiful should be lost forever. The first seconds of Rivers Of Fire could have been lifted from Peter Gabriel’s Passion album. A simple drum rhythm joins in before unadorned keyboard and guitars take up the momentum. If this song falls a bit short for me, it is because I feel that if it begins like a piece from my favourite soundtrack it should end like it. Which is probably a bit unfair towards Brendan Eyre's work, but I cannot help it. Tim Bowness implores the listener in Andy Neve’s song to Speak For Me! The world will be poorer when we are gone. More and more instruments join in, but Speak For Me remains a simple song that states its intention very clearly. Finally, the bonus track. Andy Neve’s Into The Lens is a lovely finale for the album. Close your eyes, listen, and see the most impressive image a nature documentary could find in Africa before your mind's eye. A gentle introduction is succeeded by African-sounding drum rhythms. Soprano Lorna James provided atmospheric vocals without words. In the coda her singing morphs into the lines “She walks into the lens”. Which is, of course, the moment when Lesley Wood presses the trigger and wonderful photos like the ones in this book are made. 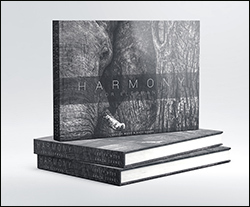 Harmony For Elephants is an impressive high-quality book with amazing photos and a well-phrased appeal – and a CD full of worthwhile and exclusive music you will not be able to get anywhere else. Plus it is an opportunity to support a laudable cause – a perfect combination. 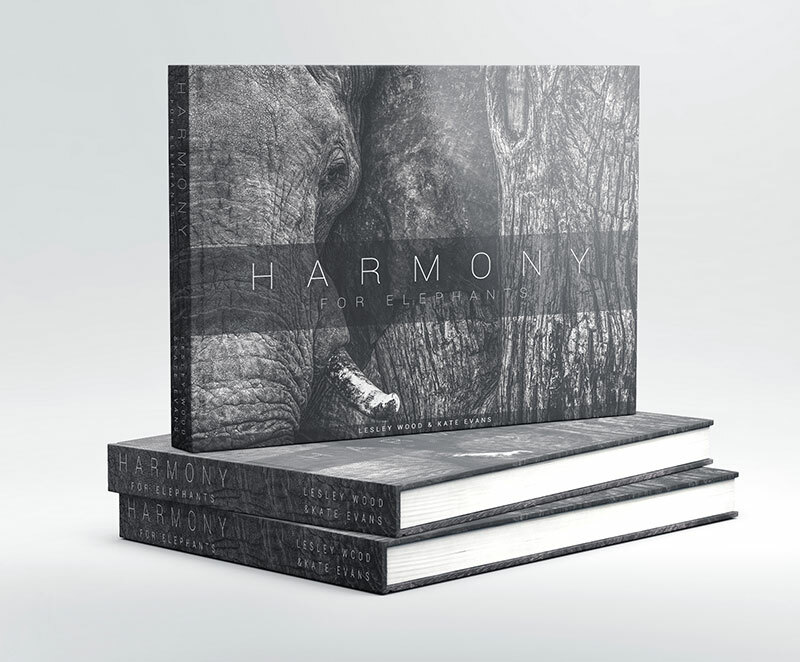 The Book/CD-Set Harmony For Elephants can be ordered from this link only.